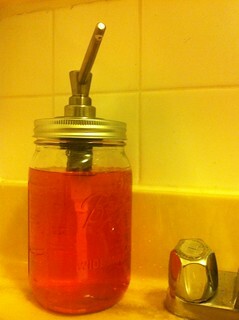 Here’s a DIY project that’s actually useful: a soap dispenser built into a Mason jar. It’s stupidly easy, so if you have no talent but want to jumpstart your Etsy career, this is for you. 1. Mason jar, or whatever. Mason jar or you could use a cool looking peanut butter jar, etc. I’m told Mason jars are hip, it’s what the cool kids are using these days. The jar is your choice, but it does need to have a metal lid. 2. Kitchen sink soap dispenser. You ever see these? Some kitchen sinks have a special hole and you can put a soap dispenser in there. Don’t buy one of the cheap-o ones, those break after a month or two (trust me on this.) Delta makes a sturdy one you can get for ~$35. Something that makes holes in metal. Or a knife, you need to cut plastic. As you probably guessed, the only step is to punch a hole in the top of the jar’s lid and screw in the soap dispenser in to that hole. You can drill one big hole if you have the proper sized drill bit, or you could just drill a bunch of small holes to perforate the lid and safely remove the middle part out with a pair of pliers. The hole doesn’t need to be perfect; the soap dispenser is much wider than the part that fits through the hole. You’ll likely need to cut the soap dispenser’s straw/hose so that it fits in the jar. Okay, you’re done! add soap and wash your filthy hands.